This is the first of the Arabelle series of popcorn stories. In a fortuitous set of circumstances the toddler launches her destiny. Arabelle's home is a log cabin in a Rocky Mountain region that would soon become the state of Colorado. This spring she is old enough to toddle the uneven ground outside without falling. Every day, she wanders to the nearby brook and plays with the water, and the stones and the mud. This particular morning, Arabelle is sitting in the brook, water diverting around her. She senses a presence. It's a mama deer with a newly-born, wobbly-legged fawn. Somehow, Arabelle knows not to move. With nothing but a scent to indicate Arabelle's presence, and needing to quench her thirst, having just delivered her baby, the doe cautiously takes a drink — only a few feet from Arabelle. The fawn, following its mom, slips and falls, its head landing right in Arabelle's lap. Arabelle tries to help the fawn back on its legs. But they both fall back into the mud. Lying there, the fawn licks Arabelle's face. And Arabelle licks the fawn. Then they both stand up and lean against each other, a precarious balance. The skittish doe moves off and her fawn follows. Arabelle toddles after the fawn, but can't keep up. 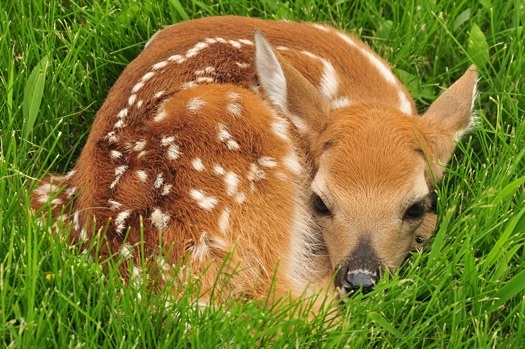 The fawn goes away. Tears in her eyes, Arabelle experiences her first heartbreak. Suddenly, Arabelle is filled with a knowingness. Her purpose in life is to walk with the deer. They are friends of her heart. As the months and a few years go by, every time Arabelle sees deer, a yearning to walk with them comes forth. Every time it comes forth, the yearning grows stronger. Use this form to send a private note to Will Bontrager, the author of Arabelle - Fawn.